With over twenty eight (28) years of real estate experience in San Joaquin and Stanislaus County, Mr. O’Leary has focused his efforts specifically on corporate representation assignments for acquisition, disposition, leasing and turn key build-to-suits. Major emphasis includes project leasing and sales for institutional, national and regional developers. Greg has leased or sold in excess of 37± million square feet of warehouse, manufacturing and food production facilities and over 5,800± acres of industrial and pre-development land. I have spent 18 years in the Industrial Real Estate arena. I have a unique blend of Tenant Representation throughout North America and Landlord/Development representation in Northern California's Central Valley. Building relationships based on trust, work ethic, and market knowledge have been the cornerstone of his success. I spent my first 16 years with CBRE. I have been a part of the Industrial Services Team for the past nine years. My core focus is representing institutional, regional and local developers, landlords, tenants, owner/users and investors in all aspects of industrial real estate throughout San Joaquin and Stanislaus Counties. My unsurpassed knowledge of the market creates opportunities for my clients. Me and my team average more than 75 transactions annually, related to warehouse/distribution centers, manufacturing facilities, flex buildings, special purpose properties and land throughout the San Joaquin Central Valley.Wes is also active in the community, serving as a member of the Pacific Tigers Athletic Association (PTAA) Board of Directors as well as the Community Maintenance Committee – Annunciation School. In addition, I was a member of the University of the Pacific Men’s Golf Term (1996-2000). I began my commercial real estate career in April 2014 as a researcher and runner for the Industrial Services Team comprised of four (4) senior partners. 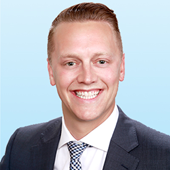 In my first eighteen (18) months with Colliers International, I was in charge of familiarizing myself with the market, tenants and landlords by canvasing the region and forming relationships. I began acting as an agent/broker in March 2016. I am very dedicated in my profession and I am continuously trying to build business and personal relationships. I work diligently to provide my clients with the most accurate and updated market information as well as adding value in every aspect of their real estate transaction.